Do you love your birds of summer? I sure hope so because they’ll be hanging around your neighborhood for a while yet. One sure way to heighten the pleasure of a special bird sighting is to brag about it later. Step right up and share your best bird of the weekend. My best birds of the weekend were American Kestrels and Eastern Bluebirds in Batavia, NY. 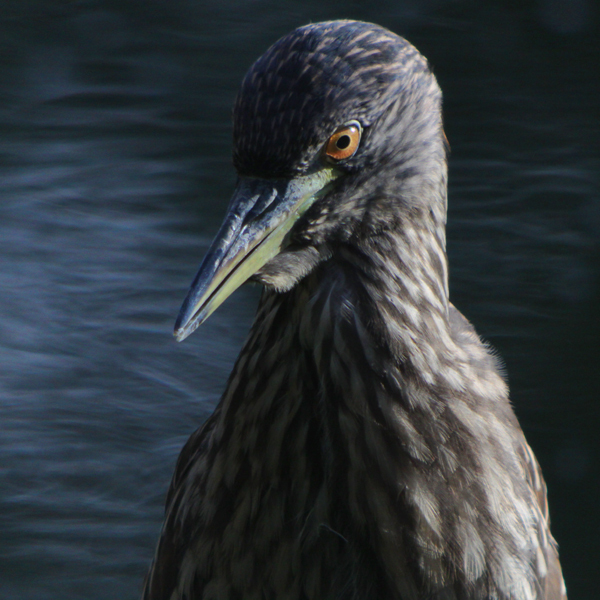 Corey’s best was a young Black-crowned Night-Heron that was more than willing to let him get some good digiscoped shots at Jamaica Bay’s Big John’s Pond. A pair of Brown Teal actually growled at a New Zealand Scaup. The teal are the least threatening bird ever! I also enjoyed the Kaka visiting the house, although they were not impressed when we ran out of apples as apparently other fruit are not what they want. I managed to get one nice shot before the battery died. Due to the heat and the world cup games, I barely left my appartment. Best bird species was yet again the Common Swift. They won’t be around for much longer and the screaming parties easily compare to the heat as the best indication of summer. Thinking about it, I prefer the parties over the heat. Congrats to Spain, but yet again the finale didn’t live up to expectations, especially compared to the quality of the “little finale” for third place. @Jochen: Between the thuggery of the Dutch and the flopping of the Spanish I agree the final was not as good as watching Deutschland beat Uruguay. But watching them beat Brazil in 2014 in Brazil will make up for the sting of third place this time, no? Bald Eagle over the house, and a pair of Western Tanagers on the golf course. @Corey: it’s gonna be 4:0 in the finale against Brazil, my friend. Sleep was battling birding, and this weekend sleep won out. So best bird of the weekend was a Goldfinch randomly flitting across the street with some sparrows. Best bird since last weekend was (I think) a Laughing Gull at Coney Island (thanks Corey for help with the ID). I originally typed “Laughing Goal” … clearly Jochen and his footballers are on the brain. Oh, I kid, I kid. It’s fun to be home and watching Costa’s Hummingbirds at the feeders. But nothing can beat the voices of Purple Martins when the monsoon clouds are building! Bald Eagle flying up the Hudson, and two cedar waxwings on the Kaaterskill in Asbury NY. Cattle Egret, Bald Eagle, Cordillaran Flycatcher, Snowy Egret, BC Night Heron, Black-necked Stilt. Above two albums include highlights of this weekend’s travels around Colorado. Why do birds living near Chernobyl have smaller brains?